What would you like to change/suggest? Well, I reckon we should have a new structure where it isn't all about gaining rank's, there's divisions implemented so we have maybe ''Doorman, Security Guard Patrol, Human Resources'', Management'', Inside these divisions there will be maybe 2 people who are the supervisors and deal with the money then they hand the 5% to Tyler or Curtis. Every new guard will start of as a Doorman and have to work their way up to Doorman III and when they've reached that rank they can apply for other divisions such as Security Guard Patrol and Human Resources. To become a Security Guard patrol you have to hold a PF License and a Guard Card, and you have to apply to become a Security Guard I. If you like to change something, what do you think is wrong/faulty with the current one? Well, it'd be more organised as we'd have supervisors and new recruit's won't feel useless as they'd be able to get promoted to different ranks as a Doorman. We already have H.R. I don't think we will need divisions for Doormen and Security Guards as we then would have to change the application system again. Also Doormen and regular Security Guard's trainings are same, both learn tactics to get people down, arrested etc. That can also get confusing if let's say Doorman has a GC, but the Security Guard doesn't, meaning their positions will probably be swapped. Hmm, what would a recruit benefit from getting promoted from a Doorman I to II/III ? Thing is, if we applied this, we will restrict Bouncer duty to Doormen only, what if we are lacking a few bouncers? Well, it's proved that they've underdone the training courses and they've been loyal to the actual agency itself as a doorman recruit and a doorman II you can't apply to become a security guard patrol, you've got to earn up to Doorman III to actually become a security guard patrol, and if they've got to work their way up they'll work even harder to earn that rank to apply to become a security guard patrol right? - Doorman won't be allowed to have any firearm unless they have been granted view the Senior Management above, so for example the only person allowed to have a firearm is a Doorman Supervisor. They've got to work their way up the rank's , and that'd be a benefit so we'd get to know them see what they are like and make sure they are trust worthy to become a proper licensed Security Guard. 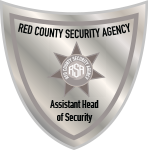 SGI, SGII and SGIII are already implemeted, the SG Supervisor is basically the Assistant head of security, We have an HR unit consisted of 1 rank, their job is to handle recruitment applications. Senior management and (CEO) are already implemented so the only thing you are adding is the doorman division, right? Tyler Holyfield wrote: Hmm, what would a recruit benefit from getting promoted from a Doorman I to II/III ? There's also this fact that people are actually more interested guarding inside than outside, which might reveal, that more people are going to apply for Security-Guard. This will also mean that doormen will get paid less, due to them being unarmed. Second of all people may not want to be standing outside, but we need people doing it right? That's why we make the new people deal with the doors intill they get a guard card and work their way up to Doorman III, It'll take some time to get ranked up and being able to apply for the Security Guard position but we'd obviously have people on the door more if they are a doorman, right? - Down to the pay that doesn't really matter as they'll keep it the same for the unarmed guards so 20,000 for casino's and 15,000 for nightclubs, as I said they have to earn some stuff before actually going into the security guard position and when they earn that they'll be able to get a higher paycheck and they'd be able to be granted the privileges of being inside. So now you are basically ignoring the fact, that we could have two divisions. The way I see this, if we let this through, doormen will be at the door and security guards will be inside. Working up to Doorman III to get inside, doesn't make any sense to me as we would have made two divisions to seperate doormen from security guards, right? I think it could overly complicate an already pretty decent rank structure. In the same sense, it will limit peoples role play as their rank entails the job they do while guarding. I think a lot of people will eventually lose interest primarily because being a doorman five hundred times in a row might get a little tiresome. Francis_Rothschild wrote: I think a lot of people will eventually lose interest primarily because being a doorman five hundred times in a row might get a little tiresome. Agree 100%, you can suggest another structure. Moved.